And we're up to 47! Come join us on our adventures. Travel with Janice An exploration of our national parks. It’s 5pm the night before our cycling trip to the Santa Ynez Valley in California. I ask Tom, “Do you have the plane tickets?” He pauses, “No. Why? Don’t you?” We have been planning this trip for nearly a year. Valley View Ranch is all set for the 12 of us (cycling friends mostly from Seattle). We also have our Amtrak tickets for the Coast Starlight from Santa Barbara back to Seattle after the ride. Unfortunately, I forgot to get the plane tickets to Santa Barbara! Luckily, the next morning we are still on our way although a bit earlier than planned. We are now flying into LA and riding the Santa Barbara Airbus from LAX to Santa Barbara. We are meeting friends from Boulder, Co before heading inland to Solvang in our “fine lookin” rental truck filled with luggage and bikes. Ninety plus degree temperatures welcome us to the Santa Ynez Valley, 30 miles to the northeast of Santa Barbara. Tom and I pass on the inaugural short bike ride and opt for the cool grocery store. Every couple is cooking and cleaning one night. After the grocery store, it’s time to check in. Wow. The Valley View Ranch is even better than expected. It’s a 7,000 square foot very nicely appointed ranch style home with 6 bedrooms, 5.5 bathrooms, pool, Jacuzzi, outdoor dining area and kitchen on 4 acres in an equestrian community right in the heart of some of the best cycling any of us has experienced. Not too bad for $500 per person per week! The challenge is that everything involves a remote control including the water slide and colored pool lights. Another challenge – life is tough – are the two steep hills up to the house after a day of cycling. Everyone is happy to be here and settles in on the lounge chairs by the pool. This trip for me is a “do over” since last year I couldn’t ride due to a back injury. That’s how I found the house – surfing the internet – while spending my week in bed in a less than modest motel, aka dump, in the Valley. Probably one of the worst trips I have ever had. This trip looks to be shaping up very differently! Each day starts with breakfast in the big indoor kitchen. Smaller groups ride different routes since the group has a wide variety of cycling speeds. Our friend, who introduced us to the area, is the route planner and advisor. The day ends in and around the pool. We enjoy a fabulous dinner each night along with some fine wine in the outdoor dining area. By the second day, a couple of friends suggest that I should go ahead and book for next year which I happily do! Very low auto traffic and gorgeous scenery creates a “cycling Disneyland” in the Santa Ynez Valley. One can go a whole afternoon and only see a couple of cars! Beautiful large live oak trees dot the expansive grass covered hills, rambling ranches, and wonderful vineyards. Day one is a short (30 miles) very hot ride around the neighborhood with the total group. I opt out early. It’s just too hot on the pavement for me! Day two we drive out (two cycle out) to the Rancho Sisquoc Winery and do two climbs on Tepusquet Road. Up, down and then up again and finally a nice stretch back to the winery for some refreshments. Next year I’d like to do the 44 mile ride out and back via Foxen Canyon Road. Day three several of us enjoy a rural ride out and back on Happy Canyon Road followed by a great sandwich in the quaint old town of Santa Ynez. Another out and back on Refugio Road, a wonderfully scenic rural road, complete our day. For others this is the big climb up Mt Figueroa, 44 miles and 4,100 feet of climbing with steep grades – 8-12%. The whole gang makes it! In fact our strongest rider, a racer, does Mt Figueroa three times during the week. Once he had to descend the whole thing on his rim due to blowouts caused by heat and elevation. Day four is a nice big 45 mile loop – Drum Canyon, Alisos Canyon and Foxen Canyon. A few of the roads have very rough pavement which is slowly being repaired. The downhill on this ride is tough. Some of the Figueroa Boyz go easy today. Day five is a 40 mile ride out to the Pacific Ocean with 2,380 feet of elevation gain via Santa Rosa and Jalama Roads. Great climbs and expansive vistas along with peaceful greenery in the valleys make this my favorite ride of the trip. Beautiful Jalama Beach is surprisingly remote. I could stay all afternoon but the return trip driver wants to get back and says, “It’s just the Ocean and sand” – my favorites! Others opt out of the beach ride to see the pros in the tour of Amgen including our local favorite, Tyler Farrar. Go Wenatchee! On our final morning in the Valley, we all pack up and depart at different times in different directions. Everyone is a little sad but looking forward to Valley View Ranch again next year (earlier while the beautiful rolling hills are still green). The racer will be entertaining his sport fishing clients outside of Ketchikan tomorrow while the Boulder friend is headed back to Colorado for a cycling race. One couple is going to enjoy Hearst Castle and the Elephant Seals near Cambria, CA while the others will be barreling their way back up Interstate Five with our bikes – thanks! Four of us are headed back to Santa Barbara for a little beach time before we depart on the Coast Starlight (ticket prices vary widely – book early) tomorrow at 12:40 pm. The Castillo Inn is our new favorite hotel one block off the beach. At the quaint Santa Barbara train station the next morning, we are greeted by our Porter who shows us to our sleeper car. As the train departs, clanging along, we sit gazing out our private window. I am very happy to be on the 33 hour adventure again. Somehow life on the train is so relaxing. It is a unique type of escape from the world. Nice meals are taken in the dining room or Parlor Car since we have sleepers. Local wine tasting is each day at 3pm in the Parlor Car. Otherwise the passing scenery takes center stage for most. As we head north, we hug the spectacular Pacific coastline until San Luis Obispo in clear blue skies. We head inland to Salinas, the “world’s biggest salad bowl”. Around dark we enjoy the lights of the east side of San Francisco Bay. Prior to arriving in Sacramento it’s time to transform our small sleeper into two comfortable bunks. I love the lower bunk. It’s great to peak out the window after waking from a peaceful night’s sleep and see where we are – Klamath Falls, OR with Mt Shasta in the distance. We continue north through Crater Lake to Eugene and finally into Portland prior to the final leg up to Seattle. As we approach Tukwila, the last stop before Seattle, we gather our luggage and know that our adventure is coming to a close on schedule at 9:30 pm. 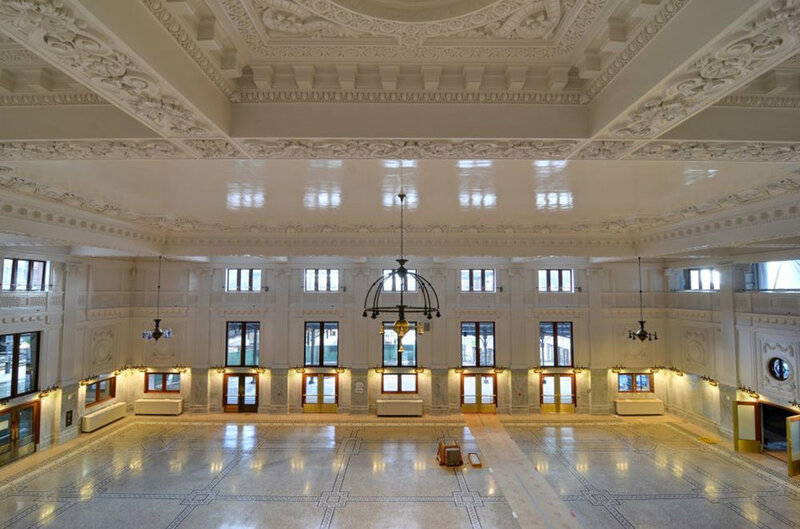 We depart the train, greeted by the gleaming white ornamentals of the newly renovated King Street Station. I stand in awe looking overhead. It’s absolutely gorgeous. The miserable trip from last year and the plane ticket fiasco are completely forgotten. Always happy to be home, we can’t wait for next year! "Grandfathered in for twelve people" is what we wanted to hear! Halfway through our second annual stay at Valley View Ranch, we are already working on the third annual trip amid a policy change. It's really amazing to me that twelve adults (and two more for dinner each night) can live, cycle and eat together for a whole week without any real issues and immediately want to do it again. The second annual continues on as the first, with more cycling - some new routes and some of the same. I miss beach time again on the Jamal Beach ride due to a closure but get to see a humpback whale! Each night the dinners seem to get more complex and possibly more competitive. Otherwise, the routine (cycle, pool time then dinner outside) continues and will continue at least for another year. Not a bad routine at all. Check out Cycling Mt Rainer National Park for more cycling fun. Subscribe to our annual update! That's all you will get. Promise. Arches, Canyonlands, Capitol Reef and Grand Canyon National Parks - an Adventure! It's a wrap! Happy, healthy season. Can't wait for next year. The cycling season begins again - always a favorite week with friends! "Five Coastal Walks You'll Love Between Cannon Beach and Nehalem, OR" is now posted on travelwithjanice.com for those of u headed to the OR coast! Happy Spring! Our beloved Salish Sea (Puget Sound) & majestic Olympic Mtns. A 50 year friendship continues! Jan 8 Saguaro National Park for the New Year! Copyright © 2019, Travel with Janice. All Rights Reserved.